Having a healthy breakfast is essential for everyone, including and especially kids. A good breakfast will give them the energy they need to start the day right and to face the challenges ahead. When you serve them a healthy meal before they leave for school, you also help them concentrate and perform better in their studies throughout the day. But for kids to enjoy the benefits of eating breakfast daily, you will have to give them something that includes key ingredients from the essential food groups for children. This means that you will have to give them more than just cereals and bread every day. The meals you serve them should be rich in vitamins, minerals, protein, fiber, fatty acids, and the right amount of carbohydrates that will give them the nourishment they need. Serving a well-balanced breakfast daily will be faster and easier if you plan and prepare the dishes ahead of time. Use the weekend to plan the meals. 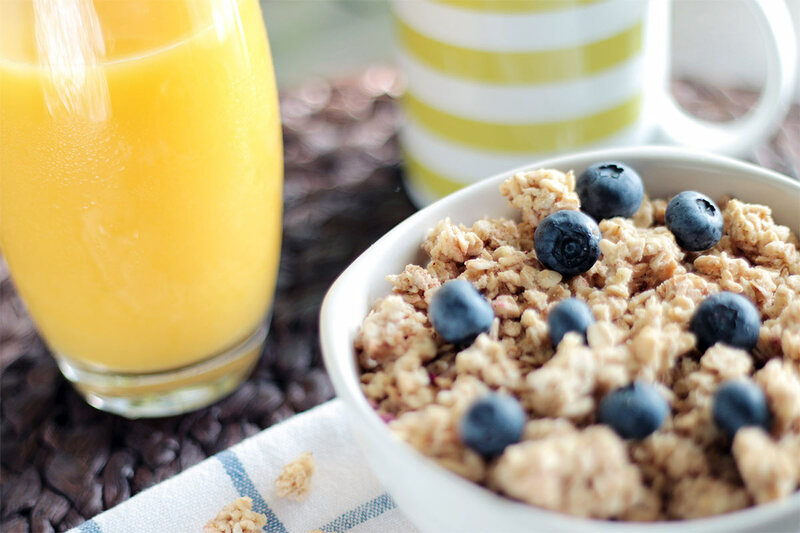 Put some thought into your breakfast meal plan to ensure you come up with healthy dishes. At night, prepare and organize your ingredients so that they are ready to cook. Take out the pans and equipment you will be using so that you’ll need less time preparing your kids’ breakfast. You can prepare fresh vegetable omelettes or frittatas during the weekend, store them in the fridge, and reheat in the morning. When shopping, as much as possible, choose whole foods and avoid bagged, boxed and packaged products. Enticing kids to eat in the morning is easier when you serve them their favorites. If these dishes aren’t exactly healthy, you can transform them into more nutritious ones. Sweet and healthy – To satisfy your kids’ sweet cravings in the morning, you may serve them the usual waffles and muffins, but give these a health boost by adding fortified milk in the mix. Partner with other foods such as yoghurt, milk and fruits to ensure they get more nutrition. Grains and cereals – Instead of buying sugary, high-calorie cereals, choose low-sugar and whole grain ones. Serve with milk and fresh fruits such as bananas, blueberries, strawberries, mangoes or anything that is in season. Toast – If your kids love to eat toast for breakfast, use whole-grain bread. Try peanut butter as a spread for a yummy morning protein boost. One of the best picky eater recipes is actually a glamorized version of toast which consists of sliced bread topped with bananas, nuts and chocolate cream (cleverly blended with fortified chocolate, for added vital nutrients). Kids can get easily bored with the foods they eat, especially if you offer the same dishes over and over again. You can get them excited to eat breakfast every day by leading them to the journey of exploring new foods. For instance, if you’re serving oatmeal, aside from milk, place an assortment of fruits in different bowls and a jar of honey which they can add to their bowl of oats. Alternatively, entice them to experiment with savory flavors as well by adding eggs or spinach to oatmeal. This is a great way to add different flavors to your kids’ regular bowl of oatmeal. If you’re serving waffles, pancakes, bagels and toast, give your children different spreads and toppings they can pick from as well. Place jars of peanut butter, jelly, jam, cottage cheese, low-fat cream cheese, and an assortment of fresh fruits and let your kids select which toppings they would like to put on their bread or pastries. Lastly, there might be days that you won’t have enough time to prepare a healthy meal for breakfast. Be prepared for these situations by placing nutritious breakfast fixings in an easy-to-grab place. Put attractive plates of veggies and dips on a lower shelf in the fridge so that the younger kids can reach them easily. Place bags of homemade snack mix or fresh fruits such as apples, banana, oranges or pears in a bowl on the counter so that your kids can quickly grab something nutritious and filling to snack on before they go to school, or to take with them and eat during recess. When you make breakfast delicious and fun for your kids, they won’t find any reason to skip this important meal. So take the time to plan and prepare the morning meals you will serve so that your children won’t miss out on any essential nutrients they need to face another challenging day.